Townsite 1, Bralorne, a jumble of buildings spilling down the hill above the mine works. It has the sort of organic layout usually associated with a mining town. The town's administrative buildings are all located here, including the Art Deco mines office just above the hill from where I sat while painting. The building on the right, according to a faded sign on its facade, was once the Bralorne Inn. Whiting Avenue, Townsite 2, Bralorne. The brown house second along was vacant,with its door hanging open, so I entered it to draw the floorplan below. A number of the other houses on the street are occupied, I think by retirees and part-time recreationists. Most of the houses are single-family, and I think have a common floorplan although there are minor differences in roof treatment and some are mirror-images, but note the white duplex next to the brown house, probably the sort of building referred to in the quote below. Bralorne is probably the most intact mining company town in the province from the years before the First World War. Unlike Zeballos, dating from the same period, Bralorne's Townsite 2 was a planned community, with curving streets and well-designed cottages that were state-of-the-art suburban design. This sort of company town re-emerged after the Second World War, most strikingly at Kitimat. 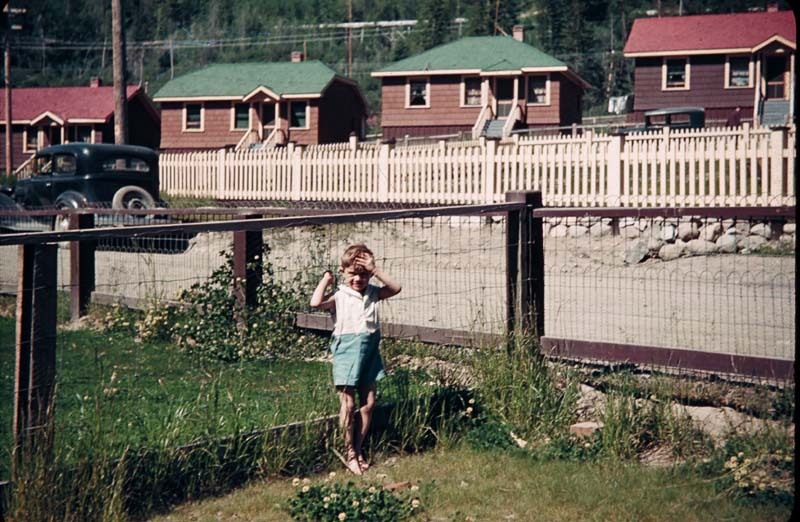 Townsite 2 began construction in 1934 on a bench about half a mile to the southwest of Townsite 1. Eventually there were about 70 houses there, together with school buildings, park facilities, a hockey rink and a church. From Toni, 2018: I lived in Bradian in the early 50s. My father was a miner and am looking for more photos to see if our old shack we lived in is in any pictures. The houses in your photo look like the ones that were right behind our old house. I went to school in Bralorne for the few years before we moved Vancouver. My last name was Ulcar. My dad was Frank. From Barbara Kovacs, 2017: George Williams and his wife Freda lived, I believe, in Bralorne. Freda had a son named Yuri. George acquired a dog named Max at that time, that he was extremely fond of. George worked at Pioneer Gold Mine for several years. George was originally from Latvia, from an upper middle class cultured family. His parents were engineers for the railroads in their area. George became displaced during WWII. At that time he met Freda and both, desperate to escape what was going on in Europe, joined forces to emigrate to Canada as a family. His first stop was to work at Pioneer gold mines. George was very creative and liked new technology. I believe he started doing photography in Bralorne. He then relocated to Powell River to work for MacMillan Bloedel Powell River Co. There he started doing microscopy. He then wedded the photography to the microscopy and convinced the company to buy him a microscope because of the value it would bring to understanding the manufacture of paper. A few years after that the company decided to build a research centre located at Broadway and Rupert Sts. in Vancouver and George relocated to Vancouver to work at the research centre as their microscopist. He advanced the microscopy over the years and in 1974 hired me as his assistant. We advanced the light microscopy to include electron microscopy and image analysis. In 1984 George went to work for The Pulp and Paper Research Institute of Canada (PPRIC) in Pointe Claire, Quebec. There he organized a microscopy research centre and group. In about 1990 George returned to the new west coast branch of The Pulp and Paper Research Institute at UBC and organized a microscopy lab there. When he retired he continued to consult on complex legal cases for PPRIC and develop new microscopy labs in Scandanavia. George passed away Dec. 17, 1999. When George left for Quebec, I became the research microscopist for MacMillan Bloedel Research and Development (MBR). In 1989 MBR relocated to a renovated research centre beside The Burnaby General Hospital. The microscopy lab was seriously upgraded and became the best in Canada with the first field emission scanning electron microscope at that time, in Canada. The MBR centre was closed in February, 1998. Shortly after that MacMillan Bloedel Co was sold to Weyerhaeuser Co. in the US. I have found it interesting that the development of microscopy in the forestry industry so closely evolved with George’s presence in the field and mainly ended with his passing. From Mike Barnes, 2014: My wife and I will be travelling towards Bralorne this weekend. I recall a driving trip with my family in the mid-60s that took us through a small and dusty town where in front of one house was a large WWI machine gun on a tripod. Dad always remembered where this was but alas he is not around to ask. I am thinking it was in the environs I am heading towards but could be entirely wrong: for all I know it may have been due east in the province. Do you know where the gun of my recollection stood? From Spyhopper, 2014: This has got to be Will Haylmore’s house where he had four WWII machine guns mounted outside of his home in Gold Bridge. (see the Haylmore settlement for exact location) On Facebook look at “Bralorne Pioneer Museum” page and you will see a post of a picture of his house with a couple of machine guns. Hope that helps! More info and pix are in the book “The Great Years” by Lewis Green. From Helen Thomas, 2014: I'm looking for information on Jim and Helen Keir. Helen's parents moved to Bralorne with their family in the 1920's from the coast. Mr Farquhar worked for the Mining Company store. Helen's mom passed away when Helen was 9 years old. [about 1942] She worked in the bank in Bralorne and married Jim Keir. They had 4 kids. Helen worked for the school board until retirement. She passed away in 2013. Jim died about 2004. They are relatives being in laws. The family doesn't know much info and I am researching for them. From Cindy Jacob looking for info for Kim Marshall, Edward's daughter, 2012: Would you happen to know anyone who might have info on the Marshall Family that lived in Bralorne approx. 1935-1966ish. Edward (aka Jack) Marshall (born in Newfoundland), my great uncle, worked as an ems in the mines, his wife's name was Margarite and they had 2 sons there, Randy and Wayne Marshall born 1938 and 1940 at the local hospital. I believe they were married at the Boultbee Memorial church. Any info would be appreciated. From Viktorija von Peternel, 2011:My friend's aunt, Antonija Yez, is buried in a town called Gold Bridge, near Bralorne. She died in 1968. My friend would like to visit her grave, but because we are from Slovenija in Europe, we would like to know, if the grave still exists. Can you help me with this information? I can't find any website with this. We're trying to find anything on "Canada message boards", because we still hope that somewhere there is someone, who knew her and her housband. She came to Canada after WW2 and there she married Anton Yez - her was from Slovenia too, but he came to Canada before her. Her maidden surname was Zagorc. She died young, in a car accident and she didn't have any kids with Anton. As far as we know, Anton didn't came back to Slovenia (former Yugoslavia), so he must be buried somewhere there too, but we don't know anything about him. [Response} From Marie-Ange Fournier-Beck, 2016: I just came across this website and wanted to pass a message along regarding this post on the Bralorne page of your website (I notice it is from 2011 so perhaps Viktorija already found an answer to this). I know Antonija Yez's grave still exists in the Gold Bridge Cemetery. I'm not certain of Anton Yez however. She can contact the Bridge River Valley Community Association for more help. They would be happy to help out. Note from Marge Carre, 2010: My family lived in the brown house until 1946. I was born in the hospital in 1939 and my brothers were also born in Bralorne and dad worked in the mine. Our house was across from church. The little boy [below] is my brother in our yard taken 1938 across from the church. Note from Jim Eddie, 2007: I own the brown house in Bralorne that you have drawn the floor plan of. My wife Sharon and I are rebuilding it as a full home. We have jacked it up and poured a full concrete basement and finished the basement off enough to live down there. We will try and make the whole house look like it did back then. We have a new roof, new windows, chimney, replaced the robbed wiring and have new shingles for the walls. We hope to have some time this spring to finish off the outside. Note from Teri Anderson, Portland, Oregon, 2004: I lived in Bralorne from 1978 through 1981 with my husband and brand new baby daughter. I still own two of the little houses right across from the Church. Bralorne was quite a place in those years. We had a hardware store and a grocery store. The Mines Hotel with its beautiful polished burl bar was in full operation. There was work around. I ran a cookhouse for the drillers that used to fly in there. There were lots of young people throughout the area with small children. We even had our own Rocking Horse playgroup. My children have grown and I am now alone, but dream and plan to return there. With my extended family, we are renovating one of my houses and planning to rebuild one that has "lost its legs". "When I was up there, there were some families from Burnaby etc. that were upgrading some of the houses. One of mine is being renovated and I am rebuilding the other. I actually plan to move back there. It is truly a wonderland to me. When I lived there, the Whitings had actually purchased the town and were selling lots and houses and there was a lot of activity to recreate Bralorne. I see that did not really happen The lots seem worth about $10,000 and with an unfinished house on it around $14,000. This is just a guess from one that I saw for sale while up there. It is the place that has value - the lakes - hiking and of course the quiet. We lost a lot of the stars when they put in those pesky street lights. My ex got arrested one night trying to correct this crime against nature."